Since 2009, we still haven’t seen other cartoonists who shine other than yourself. Why is that so? Ok. With regard to this, I can only provide the space and guidance for cartoonists, I wont be able to turn them into successful cartoonists. That is for themselves to achieve. For a political cartoonist, it is not the artistic talent that matters. 10 percent of that talent would suffice. But the artist has to be well rounded in their knowledge of issues other than just drawing cartoons. That is lacking in our cartoonists. They usually are not familiar with science, mathematics and law. There is this cartoonist from the Washington Post, Tom Toles, who is a world renowned cartoonist whose characters, in my opinion, can be drawn by some kid from kindergarten. But the message his images carry hits the mark everytime. This is why I say that the artistic talent of a cartoonist must be coupled with a strong message that results from their depth in knowledge. To be a political cartoonist, one has to be a few steps ahead of his audience. People should ask, “How did you come up with this idea? This concept had never occurred to me before” . If an artist wants to obtain that attribute, they need to fill themselves with knowledge; drawing only takes half an hour, but the priceless idea is the key ingredient. Returning to the KKI, you had said once, that your work sympathizes with the oppressed or the opposition and attacks the ruling regime. However, the political scenario now is different. The opposition camp is the government in certain states, and there are mistakes made even by them. Do you concede to having a dilemma of being blamed for magnifying mistakes by BN and not the Pakatan Rakyat. In any struggle, one must prioritize their efforts. For instance, who do you think can act on the corrupt? 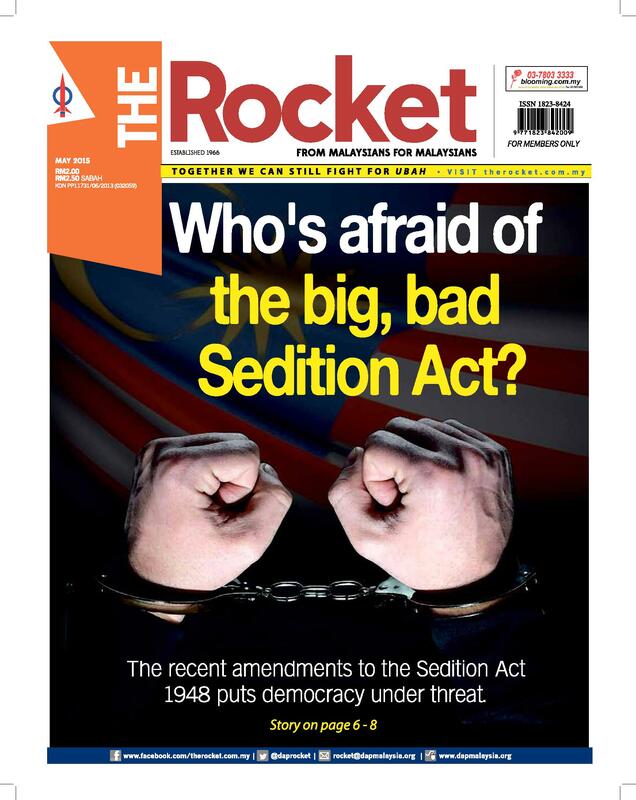 The federal government of course.Though Pakatan has succeeded in securing a few states, they cannot order the SPRM or the AG to punish the corrupt. The enforcement must come from the government who has failed to act on the corrupt state of things. Therefore, I blame the government. Of course there are those in Pakatan Rakyat who are corrupt, but I choose to hit the Federal Government for the lack of action in that regard. You, who are in power, must act, even on corrupt Pakatan Rakyat leaders, because this cannot be exercised by Pakatan Rakyat themselves. Added to that, corruption must be investigated at every level. Yes, Rm 2000 for Teoh Beng Hock’s case must be investigated, but so must the Scorpene scandal involving RM500 million. But no investigations were done. So the government has full control over all government institutions. But why haven’t they acted? Now we have racial tensions, it is something that exists all around the world. But just try to say something racist in Europe, just try it. Try tweeting something racist in England and see what happens. The police will act immediately no matter who the orchestrators are. In England, no establishment of any race based group is allowed; no such thing as a Chinese Association, an Indian Association, or a Malay Association is allowed there. Although there are acts of racism by irresponsible groups or individuals, the government actively works against it unlike in Malaysia. There seems to be no effort by the Federal Government to prevent racist acts from destroying the fabric of our society. So, unless this government is replaced, these racist acts would continue. On the role of cartoonists to challenge the mind of a reader, we rarely see cartoons that touch on the Hudud issue. Why is that? Firstly, I think there has not been proper education on Hudud; people are not well versed in the issue. How can we criticize when there is no understanding on the topic? Shouldn’t the education of the law be prioritized? Whatever the law, people should be given education, which is not seen with respect to Hudud. Lets change the government first, then we can talk about Hudud. Regarding your art, there are those who feel like you focus too much on personal attacks, such as Rosmah (Rosmoh’s) hair which seems very prominent in your cartoons. You also highlight the fact that the PM’s wife has been a spendthrift. What would you say to those who think that these are personal attacks on an individual. When someone holds a position of a Minister or a Prime Minister, then they don’t have a personal life. Whatever the Prime Minister does is not personal anymore. A Prime Minister does not have a wife, or a child, because what they are is a person with an immensely important position. His actions will not be perceived as being personal anymore. If a PM visits a zoo, should it be personal? Of course not.It becomes an official visit. Are you saying that a commendable act by the PM should be publicized but a negative view of the PM’s doings is a personal attack? Anyone who is chosen to be a Prime Minister, knows that his personal life is no more. That is part and parcel of being a PM. This includes the Prime Ministers wife, who does not have the luxury of a personal life. You are subject to criticism no matter how personal your deeds are. If you were to look at the era of the prophets, people refrained from being in power. Being a leader back then entailed a heavy responsibility. Now, as a political cartoonist, I have to use symbols by picking an object as the subject of political symbolism. I choose to use whatever object I want because I can. And Rosmah is the symbol I use because she is more powerful than the Prime Minister, in my mind at least. While I don’t mind being criticized for making that conscious decision in my work, it is entirely my decision who I want to criticize or use as a symbol. If you look at my work, Tun Hussein Onn was never present, and I didn’t really focus on Abdullah Badawi, but I did focus a lot on Mahathir; because I focus on those who are powerful. I have read in a previous interview, that during the Badawi era, you and cartoonists were out of ideas on what to draw and had to almost wish for Badawi to say something funny. 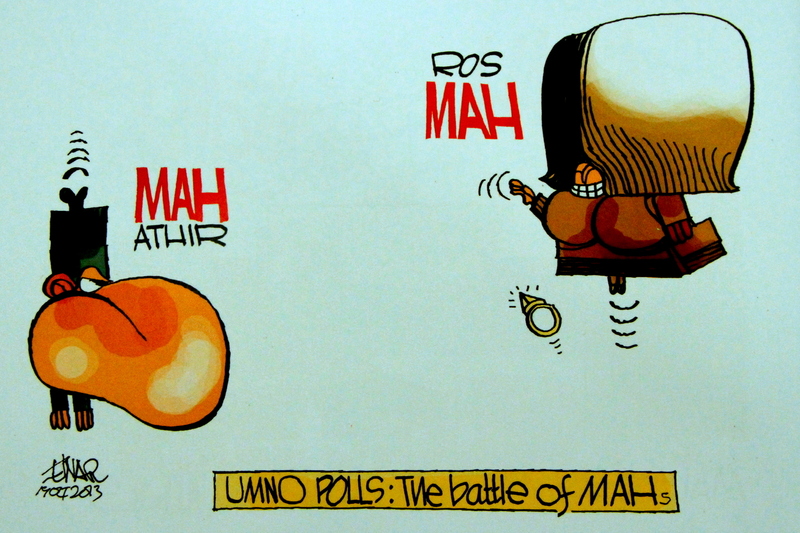 Would you say that in that respect, Rosmah is more joke-worthy than the other characters? If you look at our current political scenario, Najib doesn’t say much; he is quiet. 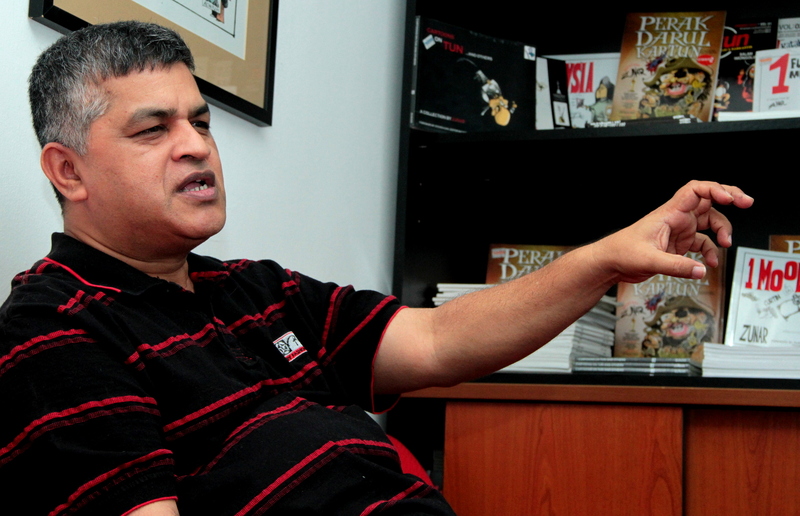 Badawi was a good person, if he were evil, he would be Najib. But both of them have done absolutely nothing in government. Back to the iconic “hair of Rosmah” which you are focusing on right now, it reminds us of the Mahathir era, when you had focused on the “nose of Mahathir”. His nose, mirrored the arrogance of BN and himself. When he disappeared from the political arena, so did the impact of your drawings; there was a clear void. Would the same thing reoccur with the end of Rosmah and Najib? Could there be a loss of focus on what to criticize? That would be my burden to bear. I would have to find another symbol if they are replaced. To be honest, I have not yet been able to achieve the same effect that “Mahathir’s nose” had in my drawings. Recreating the impact Mahathir cartoons had is a daunting task. You see, leaders SHOULD have a cartoon-able face. If they are not, then they wouldn’t be effective leaders. For instance, Malaysian leaders after Mahathir have had no impact. Hitler, is a great example, to draw him is extremely easy. Just his moustache and his hair is enough to identify him. He and his cartoon-able face had a tremendous impact you see. There might be those who disagree with me, but this is my opinion. So, for now, I cant achieve the Mahathir impact in my drawings. But I will continue to look for symbols in the same way I did back then. But I had to accept the challenge and look for new symbols to focus on. In fact, since Mahathir, I have had to change my style to not just use symbols. I had to diversify my style. Ok, there was once when Najib attempted to buy you off. Could you tell us what really happened? There was this award that I was supposed to receive from the Prime Minister in an event hosted by cartoonists and the Ketua Exco Pemuda UMNO. I happened to know the UMNO Exco, but I refused the award and the 10000 ringgit that came with it because it involved me receiving something from the Prime Minister. Any physical contact with the PM is something I would avoid. They banned my books, and expect me to receive this from the government? The only gift that I want is them lifting the ban on my books; only then will I even think of considering accepting the award. I saw this as a trap., if they took pictures of me accepting the gift from the PM, then my credibility is gone. I mean, this would be broadcasted on TV and media. What would happen to me then? What fuelled my refusal to accept the award was that the organizers of the event were from UMNO. I have never trusted UMNO, even if they wanted to pray together, because maybe they’d want to steal my shoes or something. If UMNO cheats you, then its not UMNO’s fault, you are to be blamed because everybody knows better not to trust UMNO. This article was written by admin on Wednesday, July 23, 2014 at 12:21 pm. You can follow any responses to this entry through the RSS feed. You can leave a response, or trackback from your own site.